Suzuki has always had a very potent scooter in the Access 125. It’s a solid, well-built scooter and one of the peppiest, while at it. However, it lacks severely on a few counts — youthfulness and, as a result, appeal. 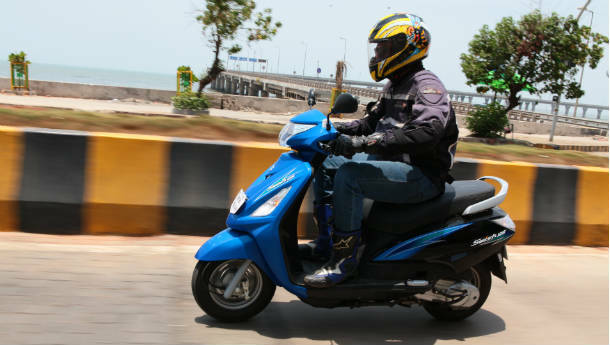 For a scooter with that kind of performance, the Access is way too bland and that’s what Suzuki aims to remedy with the Swish. Nice name, we think, and it looks younger than the scooter it borrows its motor from. Especially in the two-tone livery you’re seeing it in, it looks properly cheerful and should definitely appeal to the younger lot. Get on board and you’ll slot into a fairly comfortable riding position. It’s not too generous if you’re around 6 feet tall, but even so, space is never really an issue. The riding position is neutral and together with the seat firmness, should see off 50 km commutes without any fatigue whatsoever. That’s if your commute is the good-roads-only sort. Once the going gets uneven, the Swish does filter a lot of the bad stuff through and in comparison to the Activa, its ride quality can be termed thrashy, though not distractingly so. Let’s say, if you’re upgrading from an Activa, having worn it out, you’ll notice the unwillingness of the Swish, despite its telescopic front forks, to isolate you from bad roads and then move on to seeking joy in the fact that the Swish responds to throttle inputs so enthusiastically. While the Access bodywork was largely metal, the Swish makes do without any and is instead clad in fibre. This primarily helps in the Swish being five kilograms lighter than the Access (110 kg, as opposed to the latter’s 115) and reflects in the way it accelerates and handles. Even if you’re not an energetic college-going teen, you’ll instantly admire the perkiness of the Swish. The 8.5 bhp, 1 kg, 125cc motor is strong off the block with 60 kmph coming up in unnoticeable time — it really is better than some similarly specced motorcycles — and while it will show you upwards of 80 kmph on the speedo, it begins to run out of breath at that point. 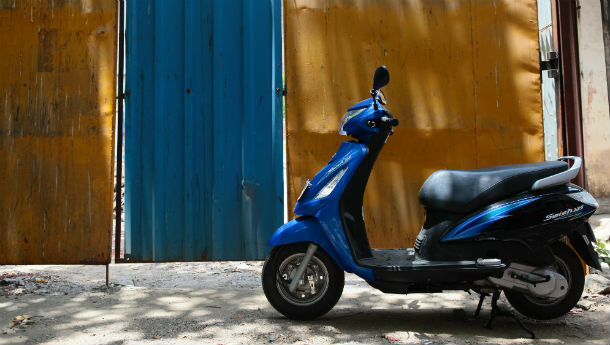 Overall, the Swish has its mind set on youthfulness and energy and that comes through in everything the scoot does. It’s sturdy, feels well-built, though not as much as its metal-bodied sibling, and perhaps the only grouse we have is the limited underseat luggage space (can accommodate a full-face helmet, but nothing more). At Rs 49,831 (ex-showroom, Mumbai), the Swish isn’t exactly cheap, but for the sort of performance you get (it’s got no competition on that front), it’s absolutely worth the price tag.